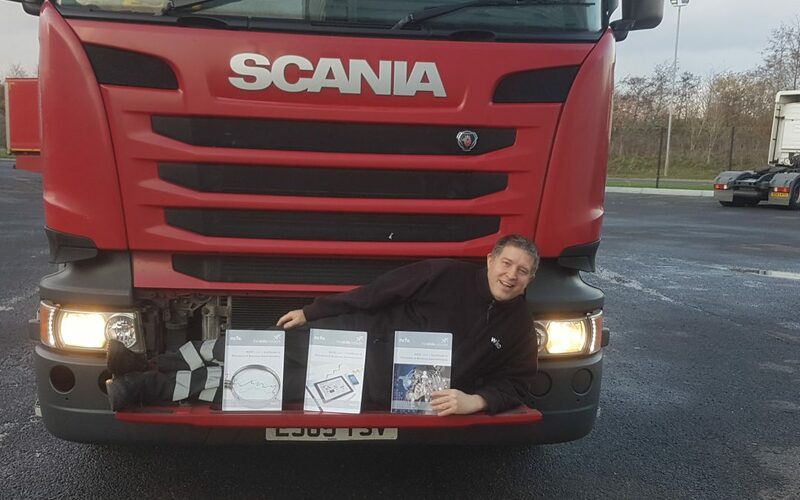 Paul is a driver for Wincanton Magor, where he is URTU Shop Steward, Health & Safety Rep and Union Learning Rep.
What made you decide that you wanted to enter back into education? I was aware of the need for further knowledge in order to become a better shop steward and become more aware of business systems and other skills needed, like IT. Why did you choose the course that you did? I was aware of my work colleague, Francisco, who appeared in the Wheels magazine who is highly trained in most areas of logistics due to his previous employment. His knowledge and understanding of business exceeded that of many employed in roles involving Transport Operation, Health and Safety and business in general. His ability to focus on necessary change and his ‘Gentlemans approach’, meant he was able to achieve right and proper change on certain things. This was inspiring. However, it would take many years for me to get close to his vast experience and I felt that this should not deter me from making a start despite my age. My primary concern was to do an I.T. course. An I.T. course appeared on the list of five courses available through the URTU Learning Project. I spoke to Kevin Ashby, who was the ULR at the time. Unfortunately, the I.T. course was oversubscribed at that time. Having missed the boat on the I.T., I felt that the best way forward was to improve my knowledge of business in general, so I enrolled on the Level 2 Certificate in Principles of Business Administration. Would you have chosen a different course given the chance again? As I said, my priority is I.T.. Fortunately, I have now been able to register on an I.T. course that is being organised by the URTU Learning project in my workplace. The nature of the course is different in that that it is hands on onsite rather than my previous experience of distance learning. What barriers have you faced and how have you overcome them? Time, time and time. I had an academic career before so I was used to putting pen to paper. However, there were times I hated the course, but I quickly realised it was because of the time pressure. Sometimes I would learn something new like what a franking machine does and I would research it on the net. I really enjoyed finding out what others seem to take for granted. Another barrier was how much to write. Having not answered questions for years, I did not know how much detail to put in and often went off track. Out of three workbooks there were two units in each with a range of 12 to 24 questions on each unit. I only had to re-answer 6 questions, which was a good exercise in seeing how easy it is, not to focus on what is asked. It is all basic skills, but skills all the same. You use them or lose them as they say. What have you discovered about yourself whilst doing the course? I have been lazy (about re-educating). You do have to get up and get on with new things to see how lazy you are or have been. And doors open immediately when you have new knowledge. You can, will, and do make a difference when you are able to speak with knowledge. Office practice and things like accuracy and proper record keeping, not to mention the express need of confidentiality, have been some of the things I have been able to contribute to with knowledge. This improvement in ability makes you feel great about playing your part. However, colleague resistance can make things frustrating and diplomacy in guiding higher Standards is essential. Don’t alienate people. You never know when you may need them, but also don’t be afraid to deliver the truth on appropriateness for people to deal with. I am better place and able to do this as a result of the course. Has the course helped build your confidence? Yes, this more than knowledge. Confidence comes from being able to communicate from a strong point of view. That only comes from knowledge and that comes from education. Some guys I work with lack confidence and trust, in their own ability. But I gently urge and shove them to have a go at every opportunity. What have you got to lose? If you have a hundred questions, put all your concentration and focus into question one. That leads to question two. You know the rest, but it’s focusing on the hundred; not one at a time, that nearly defeated me. The rest is graft and enough time to, do, check and check again. This course was a life step change after 15 years out of anything academic. What are the worst bits about going back to education? Time and finding quiet. You need the time. If you take on something you must start immediately and chip away. I occasionally left gaps of doing nothing, which I regret. Set a target of a question or two by Friday or four by Sunday night. That sort of things sets a challenge which motivates you when you beat the target. With a family, finding quiet is hard. I did go to a library a couple of times on a Saturday and found some time in breaks at work. Whatever you do; if in doubt, sit down and start a question before you wasted time thinking about doing it! What are the best bits about going back into education? My learning has enabled me to tackle critical issues more efficiently and it has given me self-respect; confidence as mentioned; a feeling of being able to make things happen, because the mystery you have experienced by knowing very little gives way to moving and shaking and getting on with it! Above all it opens those doors and plants seeds in your mind that could, just could, take you to a career or a leisure activity or be able to help others in a way you believed was not and never would be possible. Francisco left a door ajar for me. I pushed it open and walked into change that was positive, healthy and made life more tolerably fun. What I mean by this is that I have good intentions and now I enjoy making them happen or accepting they won’t and looking at doing things differently with what I have learnt. Are you planning on doing any other courses? As already stated, I’m onto an IT course which I am hoping will allow me to really fly in my role as a shop Steward and in my personal life. A good example is (don’t laugh) when I recently discovered copy and paste. For years I could not work out how it was possible to move stuff from one programme or document to another. Importantly, people did not understand my questioning about how to move things on a computer because how do you ask about something you did not know exists? One day I was talked through something different using copy and paste and the penny dropped. For days I felt on top of the world about what was possible with this simple computer tool. I’m sure many will laugh but true happiness comes in small packages and I still get a kick out of my new find each time I use it. Once on the IT course I am hoping many more ‘Ahhh Haaa’, moments will come my way. And it’s all down to the URTU Learning Project. What advice would you give to anyone who is thinking about going back into education? Do it, do it now, don’t let it defeat you, and then get help. Ask, ask and ask again. I am awash with those that think they can’t or they will look stupid if they fail. Failing is the single greatest way we teach ourselves not to fail and failing many times is often necessary to succeed. Find me someone who can thread a needle first time and I will show you someone who has learnt nothing. Threading a needle with cotton is only as successful as the number of times you fail. Feel the fear and do it anyway. There will be fear, but without it there will be no true gain. Above all, get up and start yesterday!!! If you feel that life has become a drudge then do something different, stick at it, and see where it takes you. But if you start, always finish. A start without a finish is exactly that. A finish is a personal triumph!!! Never allow yourself to keep you from your own battles, your own quests or your own triumphs. As a friend once said to me “Love a lot, trust a few, but always paddle your own canoe!”. Thanks goes to Glynn. Thanks also to Francisco, (The Business Guru), for the inspiration, and to all the staff at URTU and the Learning Project Team without which I would have done more mileage driving but had less impact on those that needed my support when they least expected it! And if you have read this, get up and go fulfil one of your dreams, even if it is a little one. Don’t let a bad school experience or age or anything get in your way. Try, try and try again!